The town is now officially classified as a 'Town of Art and History' in France. 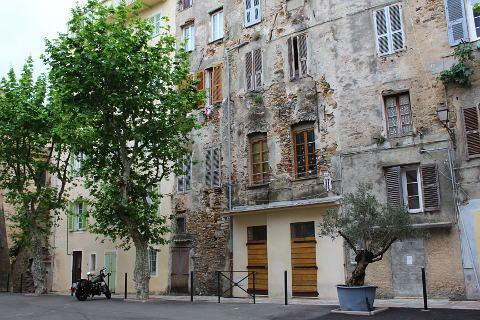 There are three sections of particular interest to visitors to Bastia: the old town, the citadel, and the old harbour. It is to the old town that you will be drawn with its faded charm of narrow streets and alleys, where washing still hangs drying from ancient shuttered windows in the tall, often almost crumbling, buildings, dating largely from the 18th century. 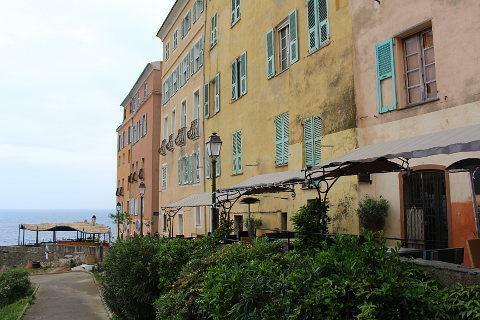 It is the character of this part of Bastia, culminating at the old port, which is the most fascinating aspect of Bastia so allow time to explore rather then rushing from 'monument to monument'. 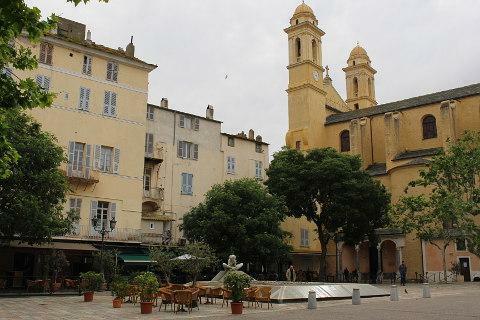 One of the main squares in the old town or the 'Terra Vecchia' is the Place du Marche which is home to a morning market and the large Saint-Jean-Baptiste church, an imposing church built in the 16th century. 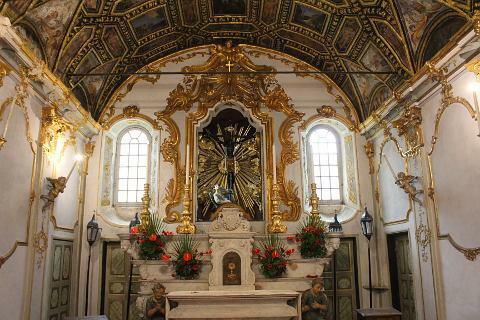 The interior of the church was renovated in baroque style in the 18th century. Nearby on Rue Napoleon is the Oratoire St Roch with a great Baroque interior and also the Oratoire de l'Immaculée Conception which has a particularly sumptuous interior including crystal chandeliers. Continue walking and at the other side of the Saint Jean Baptiste chuch is the charming port where the rather neglected buildings surround the harbour full of boats ranging from small fishing vessels to gleaming pleasure boats. 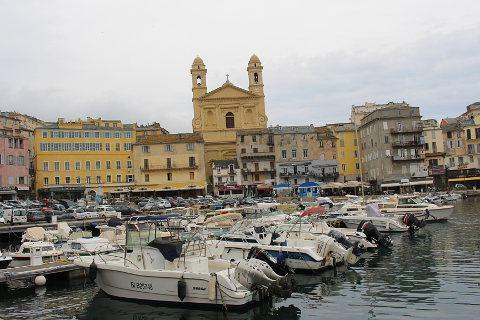 There are two ports in Bastia - the original traditional one, and the more recent port where Corsica Ferries arrive with passengers from Italy and France (Nice is the most common departure point from mainland France to reach Bastia). 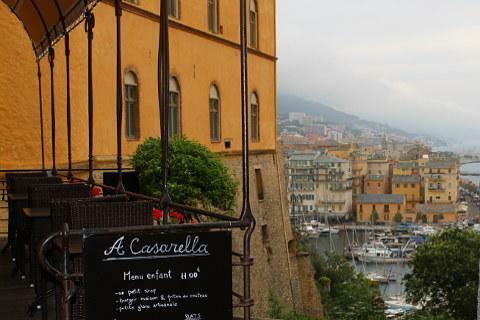 The old harbour is the 'in' place to spend your evenings in Bastia, in the many bars and restaurants, or simply promenading along the water front - be sure to walk out along the Quai des Martyrs de la Liberation for the best views of the harbour. Dominating the old harbour is the view of the Church of Saint John the Baptist. The other buildings are painted in beautiful shades of ochre, salmon and shades of gold. Sadly nearly all need a coat of paint and you have the feeling that if this was done the harbour would change from attractive to really quite stunning. The other main part of Bastia to explore is on the other side of the old harbour around the substantial citadel. This part of the town is much trendier if slightly less impressive than its old town neighbour. The walk to the citadel passes through the gardens (le Jardin Romieu) and passed the once-very-posh houses of the Terra Nova district. 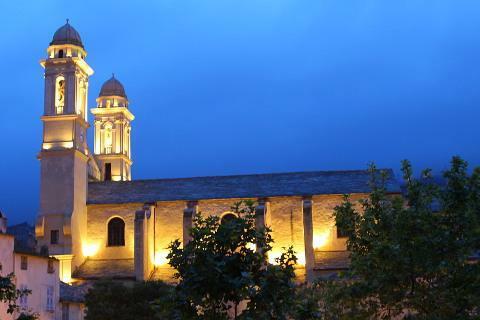 The main 'notable' buildings within the citadel of Bastia are the grand 14th century Governor's Palace and a couple of churches: the church of Sainte-Marie de l'Assomption and the Baroque Oratoire-Sainte-Croix with its 'black Christ'. The palace of the Governors was attacked and destroyed by Nelson in 1794 and rebuilt by the French when it was used as a prison. The Nazi's used the dungeons to imprison and torture Resistance fighters during the Second World War. 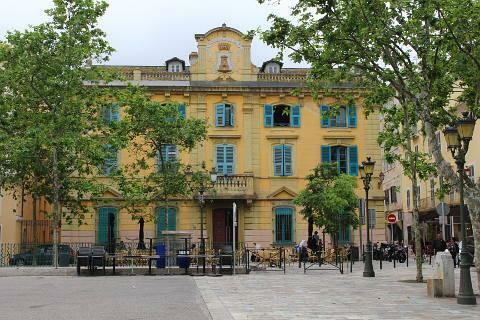 It has now been renovated and is home to the Municipal Museum with exhibits including the history of Bastia and Corsica from its pre-Roman origins to its role in the second world war. - at Murato there is a very unusual church constructed decoratively with alternating sections of white and black stone, and also with small sculptures incorporated. - a little to the east of Murato at La Canonica it is also two churches that are of interest: the roman style church of Santa-Maria Assunta, and the small Church of San Parteo. In the hills behind Bastia there is a route called the 'Upper Corniche', which has several very good views back across the town and coast. The route passes through Montserrato, Cardo, Ville-de-Pietrabugno and San-Martino-di-Lota, now heading into the western edge off Cap Corse. To the north of Bastia is Cap Corse, an interesting peninsula to explore with small fishing villages attractively set against a backdrop of mountains that run down the center of the peninsula. Many of the villages are in picturesque settings, and a tour is highly recommended. There are several splendid viewpoints as you pass around the peninsula, and also a few good beaches en route. Across the other side of the Cap Corse peninsula is the pretty harbour town of Saint Florent. The most common ways to reach Bastia are to arrive by ferry from France (Marseille and Nice) or Italy, or to fly in to Bastia airport, which has links with many airports in the UK and acros Europe.